They may define it differently, but these CNNMoney readers feel they've achieved their American Dream. 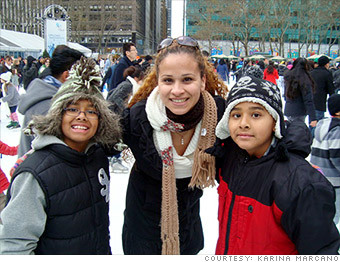 Karina Marcano with her sons, Adrian (left) and Anthony. I am an immigrant from Caracas, Venezuela, who first came to the U.S. on vacation when I was 14 years old. I fell in love with the fact that I saw a possibility of growing up in a better environment and achieving other things, such as security and a better quality of life. I left Venezuela when I was 17 with $60. I was full of energy. I didn't know a word of English. I took a Greyhound bus from Miami to Orlando, where my cousins were. I graduated from high school there. I had to work at a restaurant and several hotels. Sometimes I couldn't see my kids because I had to work so many hours. Now, I am 36 and a health insurance agent for Humana. I'm making pretty good money. I own my place. I travel with my boys. Being a single mom, it was hard but not impossible. If you are determined and know what you want in life, you can achieve it.